I grew up with this recipe, and I love it, but feel free to make your own variations. 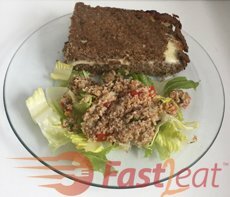 Some possible variations: add cucumber, garlic or lettuce, or use couscous or quinoa instead of bulgur. 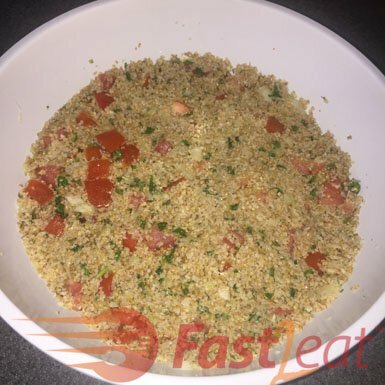 In a Bowl soak the bulgur wheat in water, cover and let stand for at least 2 hours (or overnight). 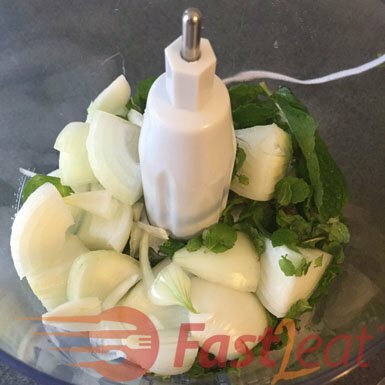 Add the onion, mint, parsley and basil to a Food Processor and pulse until grated. 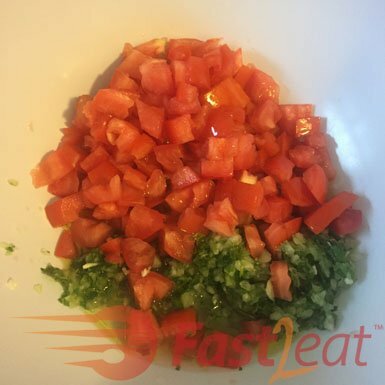 Remove the seeds and chop the tomatoes, and green onions using a sharp Knife . Be sure to use firm tomatoes. Once chopped, place the tomatoes in a Colander or Strainer to drain excess juice. I don’t use but if using cucumbers use the English Cucumbers or If you choose to use the American cucumbers, be sure to remove the skin; cut the cucumber in halves and remove most of the seeds then proceed to chop. Place the chopped vegetables, herbs and green onions in a Mixing Bowl or dish. Add the bulgur and mix gently. Add the the Lemon Juice and olive oil and mix again. Add the salt just before eat, salt will cause tomatoes to release their juices and you may need to drain some of the juice out. 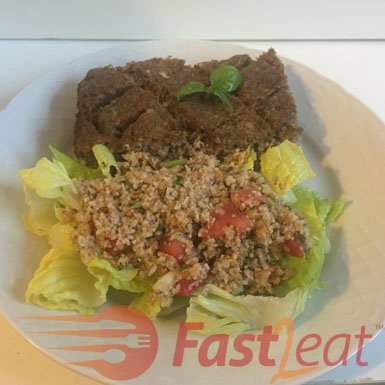 Serve the tabule over fresh lettuce leaves with Baked Kibbeh Fast2eat Recipe or a side of pita and romaine lettuce leaves, which act as wraps or “boats” for the tabule. The finer you chop the vegetables, the better. You can keep tabule refrigerated in a tight-lid container for 2-3 days or so. 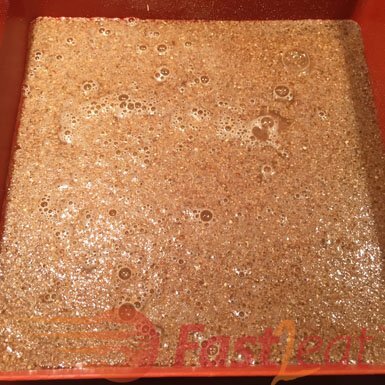 It’s important to refrigerate it with no salt added or you may need to drain some of the juice out before and after refrigerating leftover tabule.